The Stylish and trendy Baby Trend Resort Elite Nursery Center is the total nursery solution you've been searching for. 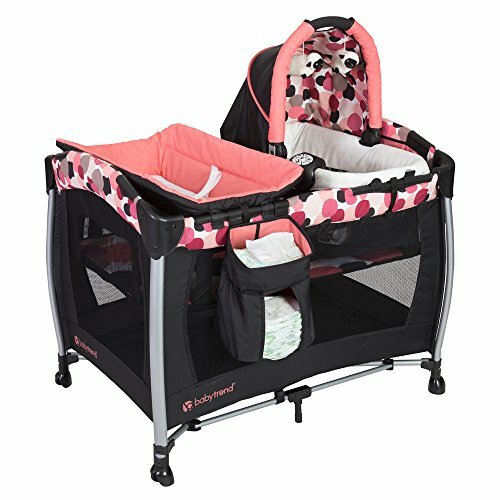 It features a deluxe Rock-A-Bye bassinet with it's own canopy, hanging toys and carry handle for removability. The bassinet also includes plush fabric and mesh sides for proper ventilation. Also included is an electronic music center with volume control, nightlight, and vibration. The music center includes two styles of music and nature sounds. Changing diapers is a breeze with the safe-surround changing table and diaper stacker, and the cozy napper lets baby drift off to sleep under the canopy and two sheep toys. The full-size bassinet can be removed as your tot grows to unveil a roomy playard with plenty of room to embark on imaginative adventures. When it's time to pack up and go, you can collapse the nursery center and transport it in the tote bag to your next destination.